As a few friends say around here, the Dreamcast is a platform that just refuses to die. A clear example of that is this new shmup called Battle Crust. Originally released for the Steam digital service in 2016, it found its way to Sega's console two years later. Giving the game a proper retail release on a dead niche platform is nothing short of commendable, even though its 16-bit sensibilities do not match the power of the Dreamcast at all. Sure it takes a lot less independent effort to offer a CD-based media instead of a cartridge, and the choice for Sega's much loved home machine was only natural given the expressive amount of independent releases it's been getting ever since its untimely demise. Battle Crust speaks to those fans of the genre who enjoy the most pure methodical old school shooting action. By adhering to a simple set of rules and sticking to the tried-and-true formula of Irem classics such as Image Fight and R-Type, the game offers a decent space adventure with a challenge level that's much more akin to console than arcade standards. The disc is region-free and comes with TATE mode available at the press of a button (Y), but aside from that it's a bare bones release with no save functionality at all. The story goes that Earth is at war against the rest of the universe. The invaders have dropped on our planet's surface deadly bombs made of a new metal (the "metal crust"), forcing the planet's defense forces to rise up and confront the menace. In order to level the odds against the universe, prior to departing for battle the ship must be equipped with one of three types of charge mechanisms: normal charge, mega charge and blast charge. Their power can only be unleashed once you acquire side pods by collecting at least one power-up. Charging is accomplished with button B (or L) and overrides the regular autoshot (button A or R), shooting out either a single beam if the button is released while the gauge is filling up or a fully-powered blast whose behavior depends on the chosen charge type. 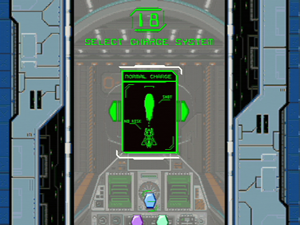 Charge types differ enough to warrant slightly distinct strategies: the normal one is much like R-Type's classic beam, piercing through cannon fodder until reaching a tougher obstacle; the mega charge is the most powerful of them and even adds a short-range energy discharge to both sides of the ship, but freezes it in place for a split-second after being fired; finally, the blast charge comes out with a certain power, and once this power dissipates against the targets the energy radius stands there for a few seconds while damaging enerything that touches it. An extra benefit of the act of charging is creating a ball of energy that serves as shield against regular bullets and damages anything that touches it. All charge shots also possess a certain degree of bullet-cancelling capability. green - needle-shaped gun with two homing side shots. Choosing a favorite weapon is mostly a matter of aesthetical preference since all of them are pretty much equal in power. The green shot however does seem to oust the others when used at point-blank distance. In any case, the balance between charging and regular shooting is quite even, which means that most of the time the charge shot isn't needed at all. It only brings real advantage if you want to add a little extra damage as the bulkier enemies enter the screen. In the world of Battle Crust players are constantly under a state of pressure due to the increasingly tight surroundings. While the first half of the credit unfolds in open areas, by stage 4 you'll find yourself navigating in cramped spaces and darting through closing gates. Stage 5 is the game's highlight in two parts: a meteor-filled entrance over alien terrain (mild Raiden vibe detected) and a fast-scrolling scramble with tight corridors and enemies arriving from all sides. And while bosses tend to die fast if pummeled hard, they often require lots of movement and bold positioning from the player who aims to properly beat the game. Slow-pacing aside, Battle Crust is fun and rewards good performances accordingly. Having weapons that are equivalent in power might be a missed opportunity gameplaywise, but at least you can take all of them for a score bonus of 1.000 points each. Another scoring opportunity comes from dispatching midbosses quickly to get a golden bug that's worth 3.000 points. The first score-based extend is achieved with 30.000 points, all others arrive at every 100.000 points afterwards; once beaten, the game rewards each spare life with 5.000 points and then adds a huge completion bonus. Finally, any attempt at milking those small projectiles flying everywhere is useless because they're aren't worth anything. A few brief bouts of stuttering slowdown are to be expected in the final levels. Other than that, some functional details weren't properly ironed out in the process of porting the game from its original PC incarnation to the Dreamcast. The spaceship rushing to the next stage is missing in those black screens between levels, for example. The audio presents some issues, such as this weird low-frequency humming that's more audible during silent moments or the music being randomly absent during the opening animation (the soundtrack is nice by the way, 4th stage BGM is my favorite). When playing in YOKO (standard orientation) the game doesn't fill up the entire screen and it's hard to read the opening texts due to the cramped resolution, that's why TATE or a bigger TV is a must in this case. Granted, my copy of Battle Crust is the European one and I was running it on a NTSC console, so that might be the reason for some of these minor setbacks. 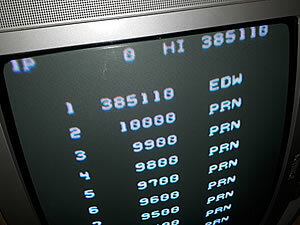 The 1CC result below was achieved in Arcade/Normal difficulty with the blast charge type. The high score tallying is quite interesting in that it differentiates the difficulty by adding a determined number of points to the starting score (none on Easy, 10 on Normal/Arcade and 20 on Hard). Continues do not reset the score but add one single point to it.